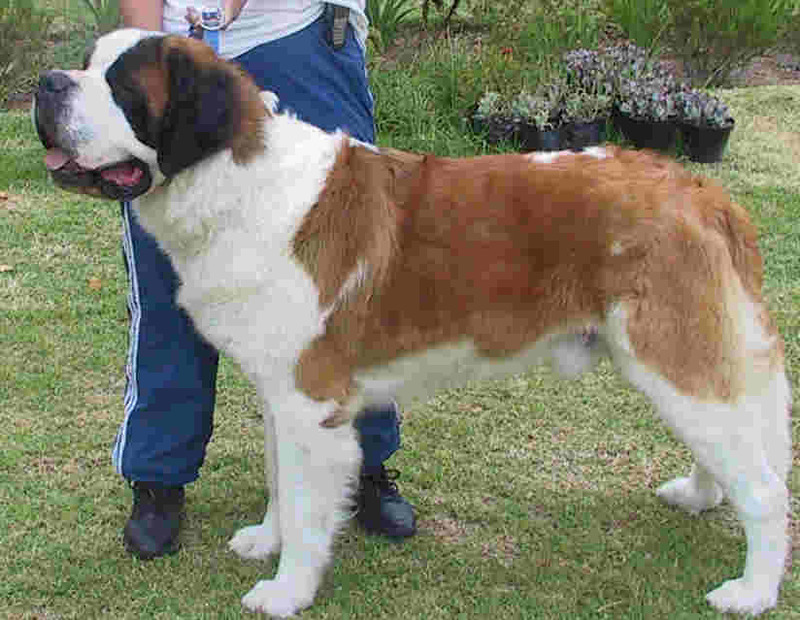 Saint Bernard dogs originated in the Swiss Alps of Europe. The word, "saint" means a person who has dedicated his life to serving God. You and I could become saints! "Bernard" is the first name of the guy whom the dogs are named after: Bernard of Menthon 923 - 1008 AD. He is not to be confused with Bernard of Clairvaux. Few people besides clergy could read and write in Bernard's day, so the early records are hazy. Bernard for much of his life lived high up in the mountains where the winters were severe. There was no public transport and supplies had to be brought in on foot. Bernard would walk for miles over treacherous terrain. He may have taken dogs with him. Many people were accosted by robbers on the lonely passes and large dogs provided protection. Dogs could run ahead and warn if the snow was covering a crevasse. Many people lost their footing and fell to an icy death. The dogs learned to find safe paths. They had an uncanny way of sensing that an avalanche was coming. Perhaps their acute ears heard the rumbling of falling snow high in the mountains. People were often buried alive under falling snow. This was before "breeds" developed. (Read early history of dogs) All dogs were mongrels. In this isolated area, dogs interbred. Only the strongest survived, particularly those with thick coats and large feet for walking on snow. Weak dogs died naturally of rabies and other dog illnesses. There were no inoculations or vets. Short-legged dogs could not walk through deep snow, so people who lived in the mountains kept bigger dogs; higher off the ground. Because man chose to live in the Alps, the dogs had to adapt to this area. 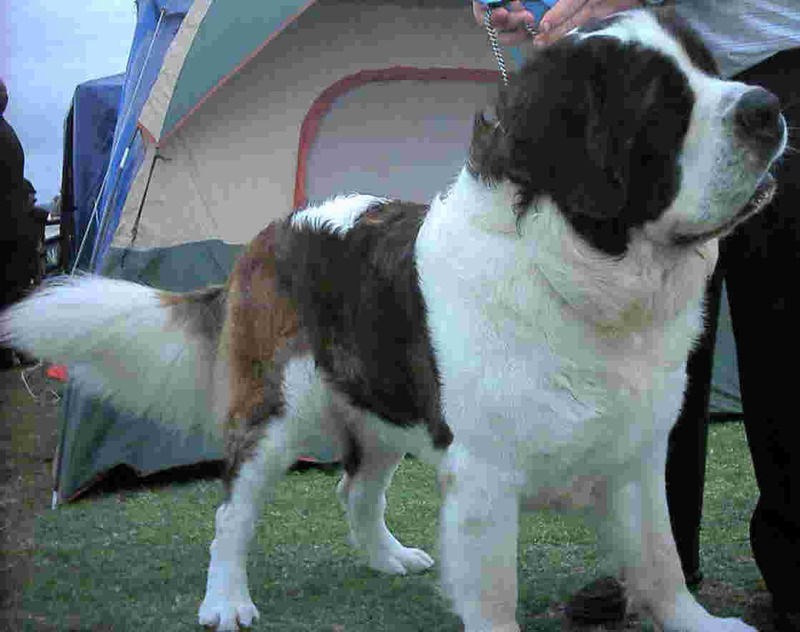 The "Saint Bernard" breed probably originated from Swiss farm dogs taken from the valleys. Bernard was a Christian who took his faith seriously. He decided to go all-out for God. He became a priest who worked for the people of the Alps for 42 years. Because of his learning and holiness he became an Archdeacon. He felt drawn to the monastic life and became an Augustinian monk. In 980 he founded two hospices (lodgings) for Alpine travelers. Bernard and the monks put their faith into action by showing compassion for anyone lost in the snow, sometimes injured or suffering from frostbite. They were rescued and taken to the hospice to recover. Male dogs were sent out unaccompanied from the hospice in pairs or packs to patrol the passes. Good-natured dogs were suited to this teamwork. Fighting and aggressive dogs would not be suitable. If they found someone stuck in snow, one dog would dig him out or lie down beside him to keep him warm while the others returned to the hospice. If the traveler could walk, the dogs would lead him to the safety of the hospice. If not, the monks would send a search party. Bernard and the other monks trained dogs to guide people through the remote mountain passes. One of these routes is now known as Great St Bernard's Pass (8000 feet above sea level) and another as Little St Bernard's Pass. Both start at Aosta in Italy and lead to Switzerland and France respectively. Both have hospices founded by Bernard. After Bernard's death, the Augustinian monks continued to run the hospice and the heroic rescue operations with the aid of dogs. Many Swiss called them Barry Dogs as a tribute to the famous hospice dog. Barry der Menschenretter who was reputed to have saved more than forty travelers during his working lifetime. It is not until 1695 that we are able to see what the dogs of the St Bernard's hospices looked like. They were painted by an artist. In 1880 it was decided to call the breed "Saint Bernard." The hospice at Great St Bernard Pass is still in use today. It can sleep 300 people but no one may stay more than one day except in an emergency. It is cut off by snow in winter. The hospice has been kept going by Augustinian monks. Food and mail has to be carried in by monks, so only young men are chosen to serve there. Bernard's dogs had short coats. The monks found that snow and ice stuck to long-haired dogs, freezing them up with extra weight. Shorter-haired dogs were more able to shake the snow off. The passes are snow-covered for most of the year. The dogs are still used to find people lost in the snow. The dogs use their massive paws to dig down in the snow to find people who have been buried and the heat of the giant dog's body has kept the person warm while the dog barked for help. If skiers fall and break a leg, the Saint Bernard dog has been used successfully to find them. Cartoons often depict the St Bernard with a keg of brandy attached to his collar to revive the lost. In reality, it is highly unlikely that the dogs were ever sent out with barrels round their necks as this would slow them down. The original dogs did not wear collars. St Bernard's feast day is June 15th. That's a good day for St Bernard dog-owners to let their dog celebrate with a feast! Let's thank God for Bernard, whose dedication to God and compassion for the lost travelers, led to the development of this lovely breed! Bernard was declared the patron saint of mountain climbers in 1923 by Pope Pius XI. In South Africa we adhere to the FCI standard, known as the Swiss standard or International standard. It is a giant breed of dogs, standing at least 65 cm high at the shoulder. The colour varies and can be white with reddish-brown, dark brown, or brindle. The length of coat also varies. The longer-coated dogs need regular brushing. They are working dogs and need lots of exercise and lots of space. They are good-natured and make good pets. Walt Disney popularised the breed with the dog "Beethoven." The source of much of the info on this page is The World Book Encyclopedia and Colliers Encyclopedia. 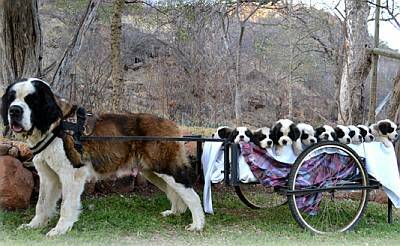 Joker, a rough coated St Bernard, belongs to P van der Watt, South Africa. St Bernard puppy Koda, above, belongs to C, Dean of Johannesburg - Koda meaning, "Little Bear" from the Brother Bear movie. At 8 weeks he already weighed 8.25kgs! A St Bernard pulling a cartload of puppies. If we have a St Bernard, we need not be afraid, as folk will steer clear of the large dog. What the baddies DON'T know is that God himself is with us! They better watch out! "Do not be afraid; do not be discouraged, for the Lord your God will be with you wherever you go."